If you have a big jar of Nutella calling your name, here’s a great recipe for Nutella Sandwich Cookies. The recipe is based on one from a book called Desserts 1-2-3. The cookies are a quick three-ingredient treat designed for people who love the flavor of Nutella chocolate hazelnut spread. The cookie shell is kind of dry and not terribly exciting, but when you split the shell and stuff it with Nutella, it’s delicious. My question is, who has self-rising cake flour? The only cake flour I know of is Swan’s (the kind in the red box) and it is not self rising. The trick is to make your own. Just mix 1 1/2 teaspoons of baking powder and 1/2 teaspoon of salt into 1 cup of cake flour. This sort of defeats the purpose of being quick, though. A good option, especially if you live in the south, is to use White Lily Self Rising flour. This is what I did and it worked just fine. Below is my version of the recipe. I used the same ingredients as Rozanne, but didn’t do any kneading or dough rolling. I just made the dough and dropped it onto the cookie sheet. Preheat the oven to 375 degrees F. Place egg in a bowl and beat it with a spoon or whisk. Add 1/2 cup of the Nutella and beat until smooth. Stir in 1/2 cup of the flour. Slowly stir in remaining flour; batter will be thick and sticky. Drop 9 rounded tablespoons of batter onto a parchment lined cookie sheet, leaving about 2 inches of space. Bake for 10-12 minutes. Let cool for at least 10 minutes. Carefully cut cookies horizontally through the center; fill each with a rounded teaspoonful of Nutella. Chill cookies. 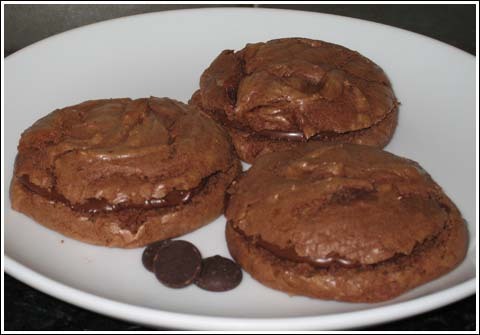 If you try the Nutella Sandwich Cookies, let me know! I love nutella!! This nutella sandwich cookies are just delicious!! I hope you like this one. It’s definitely easy. I was looking for new, easy, tasty and diferent recipes to try for my new home busines! Thanks for shearing, and thanks for all your hard work. LOVE the cookies. super easy! I just found your site as I was looking for a particular recipe. Your reference to these cookies as being a way to “transport Nutella to your mouth” reminded me of how my husband and I bought a huge jar of Nutella on our back-packing honeymoon in Italy. We also bought a bag of dry, tasteless cookies which we called “Nutella dippers.” 🙂 Great stuff! Love the new site. Your pics are always incredible! This is a perfect cookie for my 14 year old son – who eats Nutella out of the jar with a spoon! I can’t wait to surprise him with these. Thanks again for all your hard work – it’s so enjoyable. Jen, maybe Nigella herself emailed you ;). I had never seen self-rising cake flour either, so I emailed Nigella’s people to find out an equivalent. I received a kind email reply that American self-rising flour was the same as self-rising cake flour and could be substituted measure-for-measure. Yes, they’re cakey. Kind of dry too. Definitely not something you’d want to eat alone, but a perfect vehicle for transporting Nutella to your mouth. wow it looks like such a simple recipe! are the cookies cakey? Laura, I’m glad to know there’s a North Eastern counterpart to White Lily Self Rising. I’ve never seen Preso in Texas, though. Thanks Ali! Now that I have a handle on how Movable Type works, I’ll probably be making lots of little changes here and there. I can see why you like designing pages. Kelly, I have tried the Blueberry Sunrise Lunas. I like the chocolate versions better. These look amazing! This may be a bit random, but I was looking at some of your previous posts and saw that you tried to clone the luna. have you tried the new flavors? I have had recipes ask for self-rising cake flour before (Nigella usually) but I only saw it recently at my local Giant (in PA). The brand is “PrestO and it’s made by Reily Foods in New Orleans.